We are looking forward to seeing you at our 2019 show! RailEx is NZ's largest model train show. We have between 30 and 40 layouts of various sizes as well as supporting exhibitors. 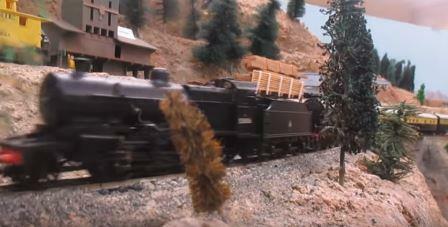 As always we have a few surprises planned for this year involving new layouts and items of interest. Adults and kids alike are attracted to the layout displays for their movement, animation and life-like presentation. You can also expect to see train related displays from local train societies and some new traders and hobby suppliers to tempt you, or perhaps just great timing in finding that awesome model train set or toy before Christmas. Regardless of your age, the RailEx show offers something for everyone. The modellers take a lot of care to add interesting little details that wait for your discovery. It's easy to spend several to many hours viewing the RailEx layouts and exhibits. Take your time to look at and watch a layout fully. Many include sequences that trigger events from time to time. LIKE RailEx on Facebook and we'll keep you informed! The Walter Nash Centre (WNC) again delivered a fantastic experience to all those who visited the 2017 showIts big and bright and easy to get to. The WNC is in the block between Taine and Tocker Streets, with the main entrance on Taine Street. If you have been involved with Netball then you'll probably know the WNC is beside the Hutt Valley Netball courts. If you aren't sure then don't worry, as we said the WNC it's easy to find! By Car: Head north on High Street from Lower Hutt (5km) or turn left onto High Street at the first roundabout after coming off the Kennedy Good Bridge from SH2. Travel another 2.7km to WNC. Taine and Tocker Streets in Taita are on your left. By Rail: This is a great transport option! Take the Tranz Metro HVL to Taita Station. Hop off and head straight down through the underpass. The WNC is directly in front of you, less than 100 metres to walk! RailEx is an annual model railroad exhibition held in the Wellington/Porirua/Hutt area and organised by three of the area's Model Railway Clubs. The organising clubs are the Marklin Model Railway Club (Upper Hutt), the Hutt Valley Model Railway Club (Moera, Lower Hutt) and the Wellington British Railway Modellers from Grenada North, Wellington. The clubs host the RailEx show to promote the hobby of Model Railways and to provide a community event that can be enjoyed by families, kids and adults alike. 30+ layouts as well as displays and trade stands. Hands on layouts for the kids to play on. Goods on sale in time for Christmas! Interested in exhibiting or being a trader? We are always looking to introduce new exhibits and vendors to the RailEx programme. If you are a modeller with a layout suitable for exhibiting, or a model railway associated trader (retailer or hobby shop) and you are interested in being part of RailEx, then please don't hesitate to contact us by filling out the form below. RailEx attracts between 3000 - 4000 visitors annually. It is held over two days, usually in October or November. This year's venue is over 2000sqm.